Be afraid. HE is coming... On Saturday 6th, Sunday 7th, Wednesday 10th, Thursday 11th, Friday 12th and Saturday 13th April 2019, all at 8pm. Matinees at 3pm on Saturday 13th and Sunday 14th April. This Spring – a thrilling homage to late Victorian gothic, and an epic clash of fictional titans to relish. London 1887. When the mortal remains of a young aristocrat vanish in the dead of night from Brompton Necropolis, Sherlock Holmes is no sooner asked to investigate than a second mystery presents itself – a beautiful heiress afflicted by unaccountable night terrors; her vitality slipping away. As these two strange cases resolve into one, Holmes and his steadfast companion, Dr. John Watson, are plunged into a hidden London of grave-robbing grotesques, murderous Szgany gypsies, and demonic possession that obscures a diabolical conspiracy to overthrow the Crown itself. 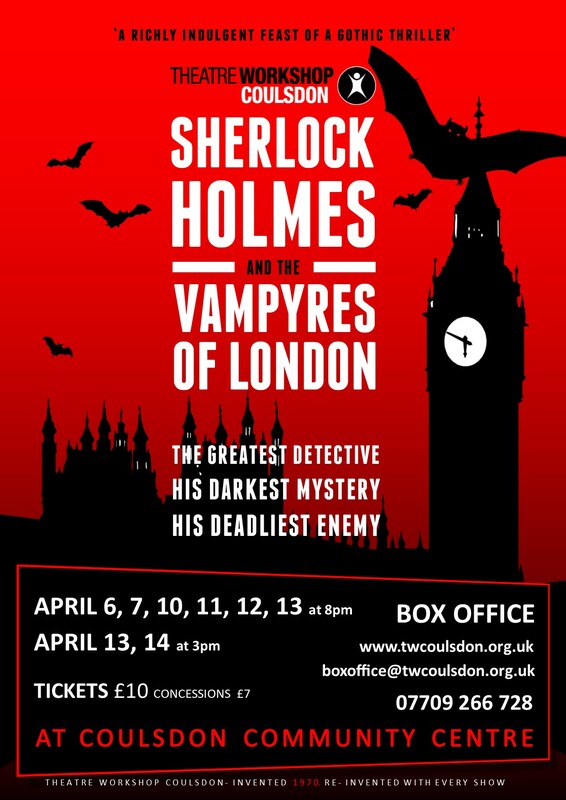 Theatre Workshop Coulsdon’s ripping homage to late Victorian gothic pits two of fiction’s most enduring characters against each other. Sherlock Holmes: arch-rationalist and dogged embodiment of British pluck and all-round brilliance, versus Dracula: carnal epitome of untrammeled lust – evil, hypersexualized, and downright foreign. But in the fog-shrouded metropolis where nothing is what it seems, which colossus of literary legend will triumph in this savage, epochal battle of wits? Note: this play contains (a very small amount of) serious swearing! Not suitable for younger children. Theatre Workshop Coulsdon was invented in 1970 and has been constantly re-inventing itself ever since. Theatre Workshop Coulsdon is a registered charity in England and Wales (No.1150788).